Definition at line 45 of file llfloateropenobject.h. Definition at line 59 of file llfloateropenobject.cpp. References LLUICtrlFactory::buildFloater(), LLPanel::childSetAction(), LLPanel::childSetTextArg(), createPanelInventory(), gUICtrlFactory, onClickMoveAndWear(), and onClickMoveToInventory(). Definition at line 73 of file llfloateropenobject.cpp. Definition at line 180 of file llfloateropenobject.cpp. 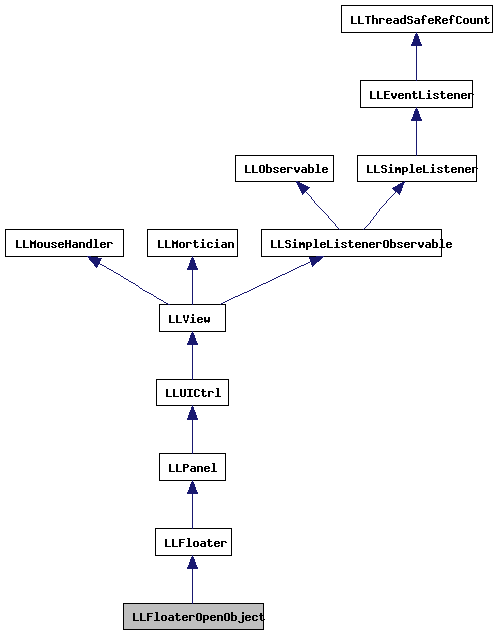 References LLInventoryView::getActiveInventory(), LLInventoryView::getPanel(), LLFloaterOpenObject::LLCatAndWear::mCatID, LLInventoryPanel::setSelection(), LLInventoryView::showAgentInventory(), and TAKE_FOCUS_NO. Definition at line 215 of file llfloateropenobject.cpp. Definition at line 101 of file llfloateropenobject.cpp. References mDirty, sInstance, and TRUE. Definition at line 90 of file llfloateropenobject.cpp. Definition at line 130 of file llfloateropenobject.cpp. References LLViewerWindow::alertXml(), LLAssetType::AT_CLOTHING, LLAssetType::AT_NONE, callbackMoveInventory(), LLInventoryModel::createNewCategory(), LLInventoryModel::findCategoryUUIDForType(), gAgent, LLViewerObject::getID(), LLAgent::getInventoryRootID(), LLSelectNode::getObject(), gInventory, gViewerWindow, LLFloaterOpenObject::LLCatAndWear::mCatID, LLSelectNode::mName, mObjectSelection, move_inv_category_world_to_agent(), LLFloaterOpenObject::LLCatAndWear::mWear, NULL, and TRUE. Definition at line 207 of file llfloateropenobject.cpp. Definition at line 199 of file llfloateropenobject.cpp. Definition at line 78 of file llfloateropenobject.cpp. References LLPanel::childSetTextArg(), LLSelectNode::mName, mObjectSelection, mPanelInventory, and LLPanelInventory::refresh(). Definition at line 107 of file llfloateropenobject.cpp. References LLViewerWindow::alertXml(), LLFloater::center(), LLSelectMgr::getEditSelection(), LLSelectMgr::getSelection(), gSelectMgr, gViewerWindow, LLFloaterOpenObject(), mObjectSelection, LLFloater::open(), LLFloater::setFocus(), sInstance, and TRUE. Definition at line 77 of file llfloateropenobject.h. Referenced by dirty(), and draw(). Definition at line 76 of file llfloateropenobject.h. Referenced by moveToInventory(), refresh(), and show(). Definition at line 75 of file llfloateropenobject.h. Referenced by createPanelInventory(), and refresh(). Definition at line 73 of file llfloateropenobject.h. Referenced by dirty(), show(), and ~LLFloaterOpenObject().